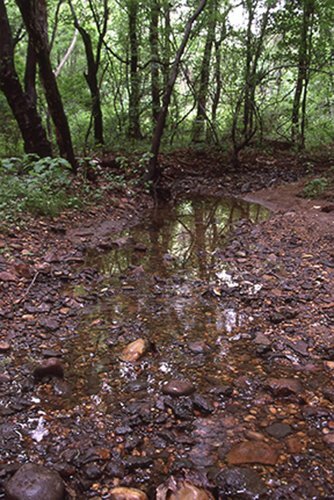 Marsh environments typically form as a result of poor drainage. 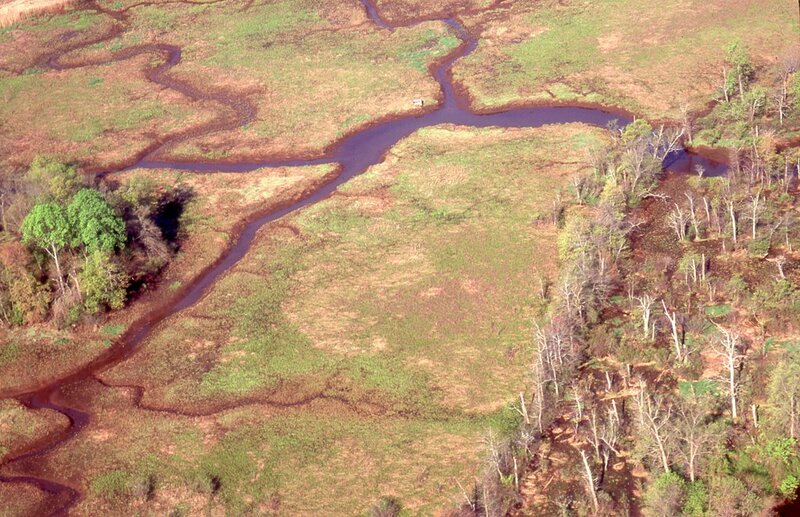 For example, a marsh can form where a low-lying area intersects with the water table or a stream system that permits water to collect in basins rather than draining to the ocean. 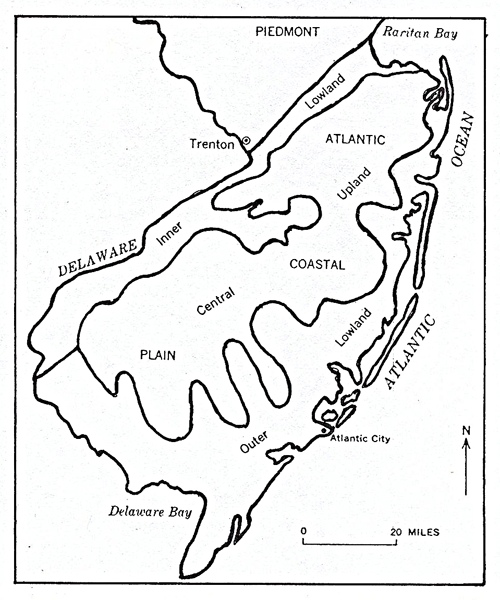 The geologic environment of the Marshlands suggests a complex history including a link to (1) durability and distribution of rock types, (2) the glacial history of the area, and (3) an adaptation to the present landscape that is largely dominated by the Crosswicks Creek and the Delaware River drainage systems. Stream processes are key to formation of the Marshlands. One element is the stream gradient, the drop in elevation in feet per mile. Areas that have a steep gradient are well drained, while those with a low gradient are poorly drained. The speed of water flow, or velocity, is determined by the gradient. Steep gradients produce rapid flows while gentle gradients result in slow flow velocities. Also involved are erosion (picking up of particles), transport (moving them from place to place), and deposition (setting them back down). Erosion and transport require the energy produced by a rapid water velocity. When gradient and the resulting velocity and energy are reduced, deposition of sediment particles takes place. Discharge, the volume of flow of a river or stream, is also a factor. A larger discharge provides more energy to perform erosion and transport of sediment particles. The Abbott Marshlands are located where the dominant local tributary, Crosswicks Creek, enters the major river in the drainage system, the Delaware River. Why are the Marshlands at this specific location? The answer lies in the geology of New Jersey and in highly dynamic stream processes that influence movement and deposition of sediment. Characteristics of adjacent geologic areas of New Jersey are involved. Lying just north of the Marshlands is the Piedmont that consists of durable, hard rocks that resist weathering and erosion. To the south is the Coastal Plain that is divided into lowland and central upland regions. The Inner Lowland, located between the resistant rocks of the Piedmont and the Central Upland, is topographically lower and has softer rocks and sediments than surrounding areas, and thus is an area susceptible to erosion. During the last major glaciation, a large ice sheet, estimated to have been 10,000 feet thick, covered approximately the northern third of the State of New Jersey. When such large quantities of ice accumulated on the North American continent (and elsewhere), sea level would have been approximately 200-300 feet lower than it is today. Two simultaneous events leading to establishing the present drainage pattern then took place. First, the glaciers began to melt. Because water flows downhill under the influence of gravity, one of the major exit routes for the huge quantities of melt water would have been through the Inner Lowland. The result would be large discharges and the ability to perform significant work (erosion and transport). 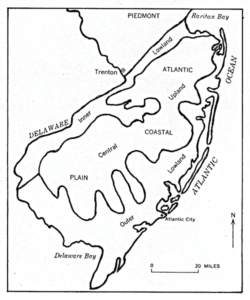 Then as the glaciers melted, sea level rose flooding Delaware Bay and effectively decreasing the gradient of the Delaware River to the tidal limits we see today. Corresponding to this decrease in gradient, the Delaware began to meander as is common in streams of low gradient. The meandering curves scoured out the area now occupied by the Marshlands. Thus, the scene was set for the establishment of the present marsh. The lower portion of Crosswicks Creek flowed into the Delaware River, as it does now. As the gradient of the Delaware River decreased, the gradient of Crosswicks Creek in the area of the present Marshlands also decreased. With decreasing gradient at the mouth of Crosswicks Creek came a decreased capacity to perform the work of erosion and transport of eroded particles, resulting in deposition of sediment. The result was the creation of a sediment accumulation basin in the area that had been prepared by a meander of the Delaware River. The area of the present Marshlands is now poorly drained as a result of a low gradient. At the same time, the continued influx of water through the upper reaches of Crosswicks Creek where there is a steeper gradient can cause erosion, transport, and provide a continuing sediment supply. This sediment is deposited as the lower gradient in the marsh is encountered. This provides for the preservation of the Marshlands even as some erosion by the Delaware River continues. The result is the unique tidal freshwater marshland. The continuing addition of sediment to the Marshlands allows for the persistence of specific zones within the marsh even as tide levels increase due to sea level rise. (Content provided by Joseph Nadeau, Emeritus Professor, Department of Geology, Environmental & Marine Sciences, Rider University).